.. examining the U.S. foreign born population and how/where foreign born by country of origin communities exist .. the U.S. foreign born population includes anyone who is not a U.S. citizen at birth, including those who have become U.S. citizens through naturalization. The native born population includes anyone who is a U.S. citizen at birth, including those who were born in the U.S., Puerto Rico, a U.S. Island Area or abroad to U.S. citizen parent(s). Use the interactive table to examine foreign born population by country by census tract. As of 2016, the U.S. foreign born population was estimated to be 43,739,345 compared to the total U.S. population of 323,127,515 (13.5%). See the related Web section for more detailed information about the U.S. foreign born population. 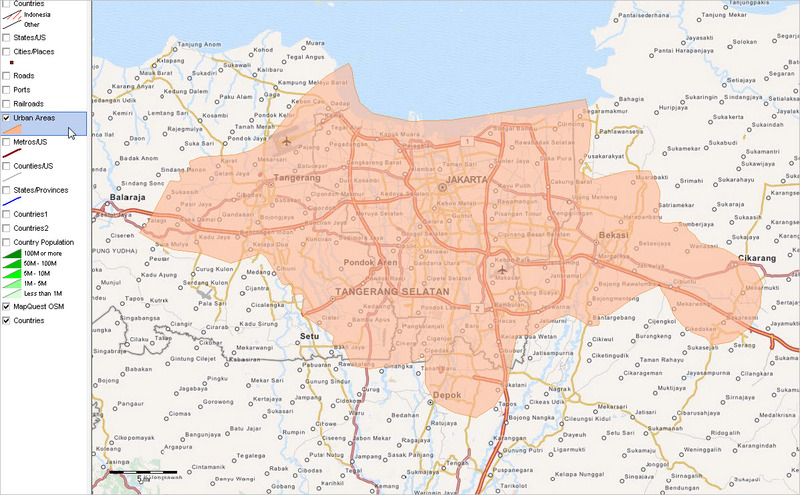 – view developed with CV XE GIS software using related GIS project and datasets. Importance of the Foreign Born Data … knowing about the geographic, demographic and economic attributes of the foreign born population tells us about the size, distribution and characteristics of the immigrant population. Projections of the foreign born population tell us how our country will grow. See more in this related section. An Illustrative View. The Chinese foreign born population is used in the graphic below to illustrate the distribution of U.S.national scope foreign born population. Other population groups could have been used. Based on the ACS 2016 5-year estimates, there are 851 census tracts having 500 or more Chinese foreign born population (of a total 73,056 tracts). Twenty of the 25 tracts having the largest number of Chinese foreign born population are located in New York City. Determine which tracts using the related interactive table. These additional views illustrate how selected foreign born country population clusters in many cases. Some develop communities without formal boundaries or any formally designated structure. Use the GIS project and tools to develop your own views for country combinations and areas of interest. The following graphic illustrates use of the interactive table to examine census tracts in Queens County, NY (code 36081, New York City). South East Asia countries (columns) have been selected and sorted in descending order on China. The table shows the size of the China foreign born population by census tract; the census tract code is shown in the left column. Use the interactive table and examine areas of interest to you. 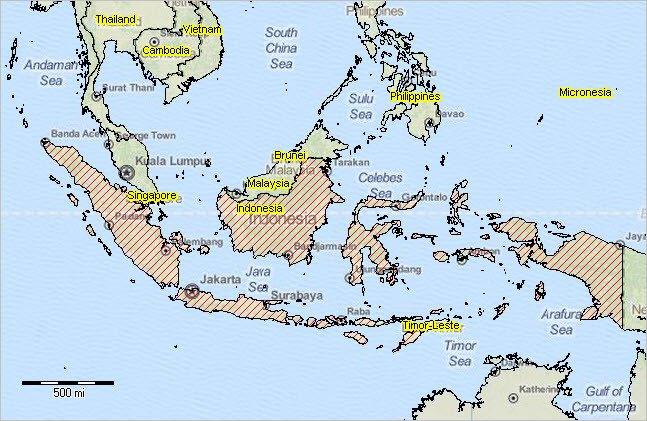 Indonesia, the world’s fourth most populous country … the population of Indonesia is projected to change from 243.4 million in 2010 to 300.2 million in 2050. How will Indonesia age-cohort patterns in 2010 compare to those projected for 2050? How do these patterns compare with those of the United States? This section illustrates use of population pyramids to examine age by gender demographic patterns for Indonesia as of 2010 and 2050. See related Web section. Similar population pyramids can be developed for any country. Population pyramids help us visualize and more easily understand age-gender structure — and how it is changing over time. Map view developed using World GIS Project. The age and gender structure of a population is one of its most important and formative features, because nearly all demographic characteristics and processes vary by age and gender. Age and gender composition is also revealing in that it reflects those demographic characteristics and processes. Population pyramid chart graphics can help us visualize and more easily understand age-gender structure — and how it is changing over time. Population pyramids for 2010 and 2050 are shown below for Indonesia with associated popualtion by age-gender tabular data. Click graphic for larger view of supplemental Web page. A top-heavy pyramid suggests negative population growth that might be due to many factors, including high death rates, low birthrates and increased emigration. A bottom-heavy pyramid suggests high birthrates, falling or stable death rates and potential for rapid population growth. The population pyramid shows a male population bar chart (left side of pyramid, blue) symmetrically with a female population bar chart (right side of pyramid, light red). Each bar shows the population by 5-year age group, 0-4 years to 80-84 years and 85 years and over. Use the ChartGraphics tools to get answers to these types of questions and gain insights world by country age-cohort patterns over time … into the future. Population pyramids developed using ChartGraphics provide an easy-to-develop and consume visual analysis of these patterns. ChartGraphics is available at no fee to ProximityOne User Group members. Join now, there is no fee. — Warren Glimpse, developer of the CV XE GIS and ChartGraphics software, is former senior Census Bureau statistician responsible for innovative data access and use operations. He is developer of the Columbia, MO GBF/DIME used as the prototype for the Census Bureau TIGER/Line system, the digital map database underlying wide-ranging Web-based mapping applications. He is also the former associate director of the U.S. Office of Federal Statistical Policy and Standards for data access and use. He has more than 20 years of experience in the private sector developing data resources and tools for integration and analysis of geographic, demographic, economic and business data.